The California Department of Water Resources has announced new rebates to help replace old, inefficient toilets and lawns with water-saving alternatives.Besides the $100 rebate to replace one toilet per household, the bigger rebate is $2 per square foot for lawn replacement, up to $2,000 per household. 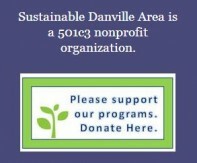 www.SaveOurWaterRebates.com. Now is an opportune time to replace your water-thirsty lawn because if the weather forecasts are right, we should soon receive El Nino soaking rains. 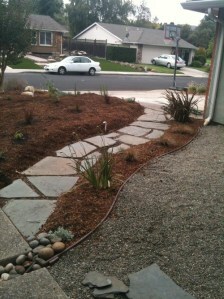 My husband and I converted our front and backyard lawns in response to the 2008-09 EBMUD emergency requesting a 20% reduction in water use by residential customers. We stopped watering our lawns¾and plants¾with the idea that anything that couldn’t make it on once a month watering would be replaced. Once we had our plant layout, we knew exactly where we needed water, so we converted our sprinklers to drip irrigation. This weekend project was accomplished with a trip to the local hardware store that offers a screw-on octopus replacement to sprinkler heads that make it easy to connect tubing and drippers. 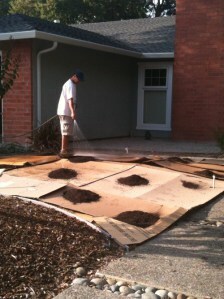 Once the sheet mulching was done, we covered it with 5 inches of compost. I was able to plant over 60 plants in one afternoon and because I used 4-inch sized pots and there was no need to dig into the cardboard/newspaper. While I was doubtful the plants would fill our yard, Chris assured me that they would be full-sized by spring. But she was right. 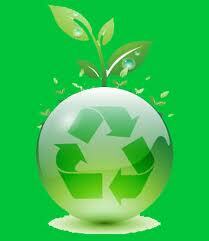 I encourage you to visit lawn conversion page to see more pictures and learn more about the process. 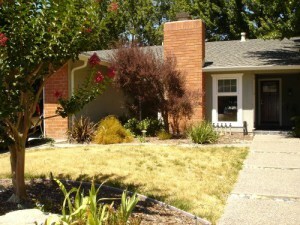 This entry was posted in Cynthia Ruzzi, Cynthia's Blog, Sustainable Danville Area Forums, TIP OF THE MONTH BLOG, Uncategorized and tagged Cynthia Ruzzi, Cynthia's Blog, drought tolerant plants, sustainable danville area, Sustainable Landscape, tips for saving water, water conservation, Water savings. Bookmark the permalink.